Attentional bias has been the subject of extensive empirical investigation in connection with chemical addictions, and it has been demonstrated in users of several different substances. The findings show that substance users seem to notice and attend to substance-related stimuli more readily than non-substance-related stimuli. Less is known, however, about attentional bias in pathological gambling. This systematic review investigates the existing empirical evidence on attentional bias in problem and pathological gamblers. Eleven studies were identified and evaluated following a literature search. 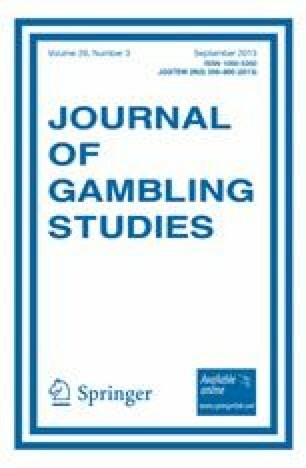 Key findings are that problem and pathological gamblers seem to exhibit attentional bias toward gambling-related stimuli across different measuring paradigms, although some negative findings were reported. Recommendations aimed at improving research on this topic include better validation of measures, the inclusion of manipulations of craving level, and adding variations in gambling severity as a variable, as well as gambling preference. Research on therapeutic procedures aimed at reducing attentional bias is also recommended. Crockford, D. N., Goodyear, B., Edwards, J., Quickfall, J., & El-Guebaly, N. (2005). Cue-induced brain activity in pathological gamblers. Biological Psychiatry. doi: 10.1016/j.biopsych.2005.04.037. Fadardi, J. S., & Cox, W. M. (2009). Reversing the sequence: Reducing alcohol consumption by overcoming alcohol attentional bias. Drug and Alcohol Dependence. doi: 10.1016/j.drugalcdep.2008.11.015. Schoenmakers, T. M., de Bruin, M., Lux, I. F. M., Goertz, A. G., Van Kerkhof, D. H. A. T., & Wiers, R. W. (2010). Clinical effectiveness of attentional bias modification training in abstinent alcoholic patients. Drug and Alcohol Dependence. doi: 10.1016/j.drugalcdep.2009.11.022.